What If Only Men Voted? Only Women? Only Nonwhite Voters? Imagine if only one group of Americans cast their ballots this November. What would happen to the electoral map? We’ve conducted this kind of thought experiment before; it can help shed light on why the parties are hoping that certain groups — such as suburban women for Democrats, white working class voters for Republicans — will help them win seats in 2018. So let’s take a look at our first scenario to help explain what I mean. On average, women leaned 17 points more Democratic in October polls, but the generic ballot average leaned D+9, so women overall were 8 points to the left of the nation. So, say a district had a forecast vote share favoring the Republican candidate by 7 points. Under these conditions, an all-women electorate would elect the Democrat by 1 point. Now, shifts like this would not happen uniformly across the country — women in Wyoming are likely more conservative than women in Hawaii, and we’re not taking into account the specific demographics of any given district. But despite that, the results do help underscore just how far apart different parts of the electorate still are. 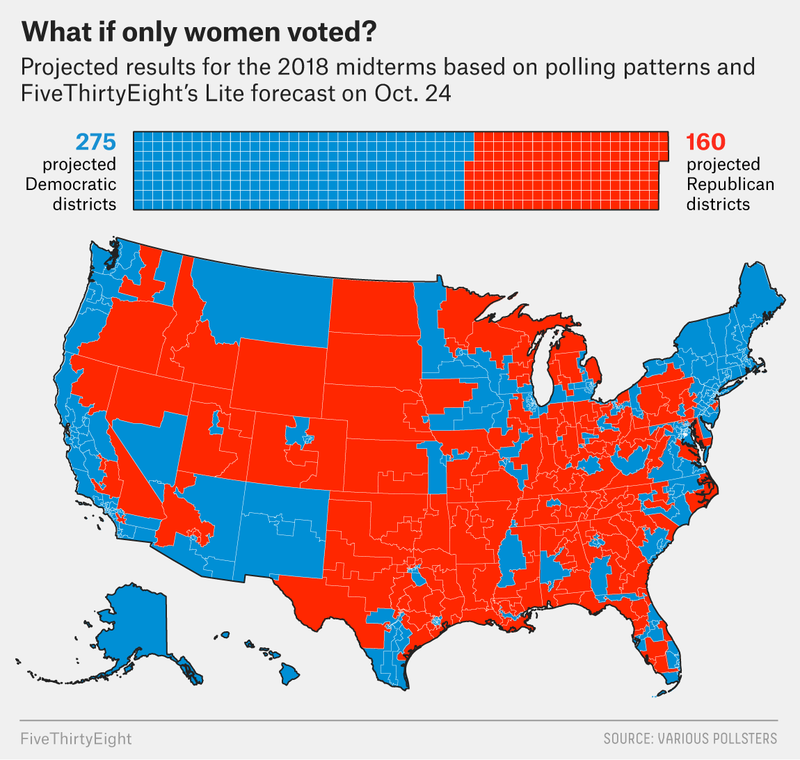 A women-only electorate would give Democrats a huge House majority: The adjusted vote share estimates suggest that women would elect 275 Democrats to just 160 Republicans, which is 44 more Democratic seats than the 231 projected Wednesday in the Lite version of our forecast. To put that in perspective, the last time either party won more than 270 seats was in 1978, when the Democrats won 278. 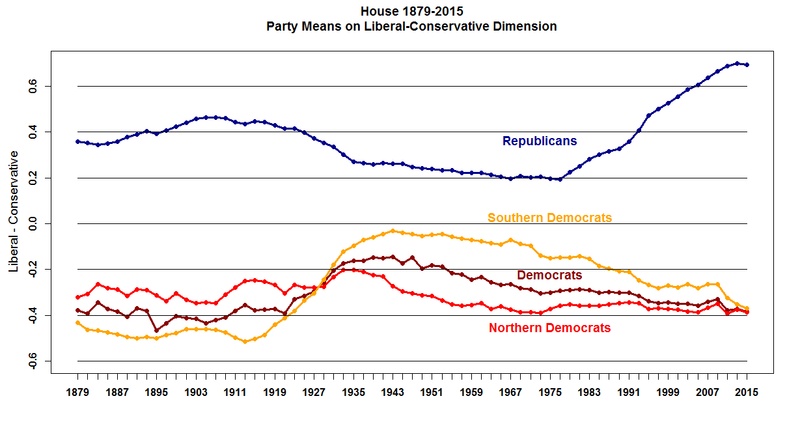 But that was a less polarized era, and Democrats held a number of institutional and partisan advantages in the House. Since 1994 — sometimes seen as the starting point of our current political era — the Democrats’ 257-seat result in 2008 stands as the best mark for either party. Men, on the other hand, were about 11 points more Republican than the country, and as such, they would elect a 249-to-186 Republican majority. But notice that the GOP seat total that men would secure is lower than the 275-seat Democratic majority that women would elect. This isn’t because men have shifted to the left but because the overall national environment is Democratic-leaning. If it were a Republican-leaning environment like in 2010, women might elect a more closely divided House, but men would likely elect an even larger GOP majority. The 2016 presidential election saw a more pronounced cleavage among white voters based on their education levels. College-educated whites shifted toward the Democrats, and whites without a college degree moved further into the GOP camp. The generic ballot data found that college-educated whites were about 2 points to the left of the country. That might not sound like much of a Democratic advantage, but remember that the national environment was D+9 at the time of this analysis. Under these conditions, white college voters would elect a 233-to-202 Democratic majority, which isn’t all that different from where the Lite forecast sat on Wednesday: a 231-to-204 Democratic majority. But remember, we’re just looking at a group’s estimated vote share; the model looks at much more to calculate its probabilities. If we were to look at just the difference in the estimated vote share in the Lite forecast, it would show a 219-to-216 Democratic edge, or 14 fewer Democratic seats than if only college-educated whites were to vote. This shows that there is a Democratic lean among college-educated whites, albeit a slight one. If we look at white voters without a college degree, their party preference was even more pronounced than college-educated whites. They were 27 points more Republican than the nation as a whole. And as you can see in the map above, if only they were to vote, the country would be almost entirely red outside of big cities. Non-college whites would elect a 268-to-167 Republican majority, but the GOP majority might be even larger than that. Some heavily Democratic districts, particularly in the South, would probably elect Republicans even though those districts are blue on our map, and that’s because of a long legacy of racially polarized voting.4 Whites without a college degree in a place like South Carolina’s 6th District, which is 57 percent African-American, would probably elect a Republican instead of Democratic Rep. Jim Clyburn. After all, Trump won 70 percent of the white vote in South Carolina. We found that nonwhites leaned 33 points more Democratic than the national environment and their adjusted vote share would net a 388-to-47 Democratic majority. However, similar to what we saw in the scenario of whites without a college degree, the Democratic total is likely underestimated. 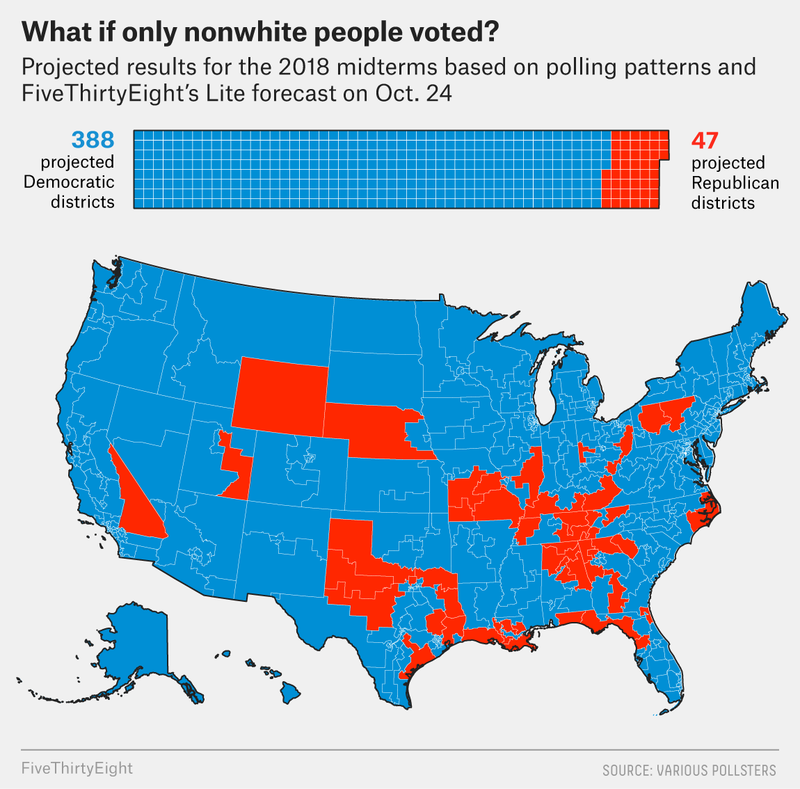 The map suggests that some Southern districts would vote Republican, but again, because voting is so racially polarized in the South, it’s unlikely that these seats would elect a Republican if only nonwhites voted. For example, the Alabama 6th District — held by Republican Rep. Gary Palmer and still controlled by the GOP in this scenario — is 16 percent African-American, which is the largest minority group there. Given that about 90 percent of blacks in Alabama vote Democratic, it would probably be very hard for a Republican to actually win. Nonetheless, the overwhelming Democratic House majority in this scenario makes sense if we look at nonwhite voters as a whole and don’t drill into specific districts. But for all the talk of college-educated white voters boosting Democrats in 2018, nonwhite voters will also be vital to their chances — especially in diverse suburban districts, particularly in the Sun Belt. If you’re wondering why many Democrats are talking about health care and many Republicans are doubling down on immigration, it’s with an eye toward the types of voters most likely to support them in November — in this case, women for Democrats and whites without a college degree for the GOP. We took the most recent generic ballot polls from 10 pollsters — collectively the surveys were in the field from Oct. 4 to Oct. 20 — and used the crosstab data for party vote preference by gender and race, along with education among white voters. If a group was not mentioned in a poll’s crosstabs, I contacted the pollster to get the data. The generic ballot poll averages include data from all 10 pollsters except for education among whites, which came from eight of the pollsters. In other words, I subtracted the forecast Democratic vote share from the forecast Republican vote share in each district. Data is as of 7 p.m. Eastern on Oct. 24. We use the Lite version of our forecast because it relies only on polling data. This would also be the case for college-educated white voters in some districts. For example, Cuban-Americans are Republican-leaning compared with Latinos as a whole.